This gets a bit long, but I'm providing a list for Ben as well as expanding on a comment from the previous post. Keep in mind that for all of this, I'm working with something D&D-ish that is intended to be similar to 2e. The idea is that some specialist mages have a different way of casting spells. I'm inspired by the Ars Magica system with its Verb-Noun method of categorizing spells. My system goes a bit beyond Creo Terram (Create Earth) into something like I Create Now a Small Thing with Curves Using Red Magic. Create is the verb, Now is the adverb (demonstrating time) Small Thing with Curves is the Noun, Red is the adjective. That's certainly one way to go, but let's assume we're going to streamline the verbs a bit now to allow for a greater number of nouns. The school of time is going to be dealt with later. It is going to become something that can (but doesn't) affect any spell. Down to eight. Enchantment and Illusion are similar enough that they should be one school. Down to seven. What do to with Necromancy? The force of Undeath is very much a D&D thing. A spells that create undead don't have a good way of fitting into the system. Then again, this school encompasses all kinds of things from Evocation to Charm to Conjuration. It's not so much a verb as much as it is another classifier, a type of thing to be created, changed, etc. We'll make undeath a classifier. Down to six. I Protect (Abjuration) - Any spell that creates a purely defensive effect. This would also apply to dispel magic or anything that counters magic. I Create (Conjuration) - Any spell that creates matter or energy. I Beguile (Enchantment/Charm/Illusion) - Any spell that attempts to alter perception or trick the mind. This also covers illusions and illusory effects. I Call (Invocation/Evocation/Summoning) - Any spell that manipulates matter or energy. (In Latin evoke is to call out and invoke is to call on.) This also pertains to spells that summon matter, like summon animals, summon air, etc. I Change (Transmutation) - Any spell that changes the shape or form of an object. It also pertains to any spell that changes the form or energy. Lastly, it also relates to spells that grant new abilities like flying, burrowing, etc. Could these six be changed into the five verbs of Ars Magica? Yes they could. In many ways the verbs are different mostly to keep as much compatibility with D&D as I can. In other words, I don't have to think too much about where the various spells fit because the schools are matched to a specific verb. What do to with time? For almost every spell, time will be Now. The effect is created in the present time and continues in the present time. Specifically with time, I want to have a marker to tell when the spell began (past, present future) and when the spell ends (past, present, future). In gameplay, spells that go backward in time are problematic. However, I imagine scenarios where a mage that can use time would cast Illusory Terrain that would go backwards in time if he/she is being chased by someone a few hours behind. I also imagine that many spells would not be used to generate an effect somewhere in time as much as place an object somewhere in time. In other words, sending an object back to the past. Being able to manipulate time would be available to only specially trained mages at higher levels. There wouldn't be a 1st level mage casting a Sleep spell backwards or placing a Magic Missile in the future. There's a lot more to explore here. Here is a more comprehensive list of classifiers in the Malay language. It's not complete and classifiers change over time. You'll notice redundancies, but I consider that part of the "otherness" of the list. I haven't finished translating everything yet, nor have I started to pare down the list. Anything with question marks is where I am unsure. I don't speak Malay, so I'm not an expert. pangsa flats to share in the fruits?? durian?? There is a lot of room for paring this list down. For example, fruit with a cob has only one example I can think of. Nerves and thread are incredibly similar as both deal with hair,yarn and wire. However, I don't want to simplify the list to remove redundant entries. I only want to pare it of things that would be for very specialized uses, like the cob-fruit one. I may even take one off the list that has a few items in it that I could later introduce through an NPC mage. As I said, lots of work to be done here. Any and all suggestion welcome. The only three guidelines are that I want to end up with a list that is larger than ten a list that does not remove all redundancies and a number of classifiers divisible by five. The reason is that a mage using this system gets a number of classifiers at every odd level. The idea behind adjectives is simply to introduce something like oppositional schools. 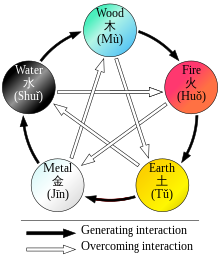 If you think of Wu Xing with the cycle of generation and the cycle of destruction, you'll get where I'm going with this. Don't think of them by the elements, just focus on the color. I didn't use the five color scheme, though, opting for a six color one instead. The main rationale for this will make sense later. I didn't want a character to spend a lot of time pondering which color to start with. There's really no min-maxing that can occur because color provides no real advantage that the player can control. All of this seems like a lot of trouble for something that may or may not be worth trying. However, the execution of this idea is intended to be pretty straight-forward for players. To create a 1st level character, they choose one verb and one noun. Depending on the final number of nouns one or two more are randomly rolled. If the GM wants, the player can choose a color, otherwise a simple d6 will choose the color. Why the random roll for some nouns? It's the nature of the magic language. You learn one useful noun and get at least one unusual one to boot. Since the spell list is generated, much like Ars Magica, players pick one spell for each classifier they have and start playing. This was 1976 words. Probably too long for a single post. I'll work on smaller chunks of it later. Let me know what you think.